Winter playoff season has arrived — and this weekend was full of results that surprised, shocked and stunned this sports writing team. Some flourished. Some floundered. And other teams just kept on going with the regular season schedules. It was a wild sports ride as we went into reading break, folks. We don’t want to jinx this one — but things are looking promising for men's volleyball. After a lacklustre start to 2018/19, the team managed to turn their season around and clinch a playoff spot in their final two regular season games this past weekend. The reigning national champions claimed their playoff placing in their Friday night match up, a five-set ordeal against the Calgary Dinos which the T-Birds ended up claiming with a 15-12 final set score. They also won Saturday’s game 3-0. The team heads into playoffs in the seventh Canada West spot, which means they will head to Langley next weekend to face local rivals and Canada West second-seeds, the Trinity Western Spartans, in the quarterfinals. Just one month ago, the two teams met in the regular season and split their two-game series. If history says anything, this will be a wild match up to watch. Out on the ice, UBC women’s hockey made it a sweep against the Regina Cougars in their opening playoff round and are moving on to Canada West semifinals. On both nights, the women managed to rack up five goals, taking the series with a 5-0 Friday win and a 5-1 Saturday win. Even more impressively, the goals came from a plethora of players. Hannah Clayton-Carroll and Madison Patrick were the only players to score multiple goals over the weekend, with each of them scoring a goal a-piece in each game. Other goals came from Mathea Fischer, Hannah Koroll, Brielle Bellerive, Emily Costales, Emily Moore and Ashley McFadden. Fischer also earned a Canada West first star for her six-point weekend. She had two assists on Friday, alongside her one goal and another three assists on Saturday. The team now moves on to face the Manitoba Bisons, the defending national champions, next weekend in the Canada West semifinals. 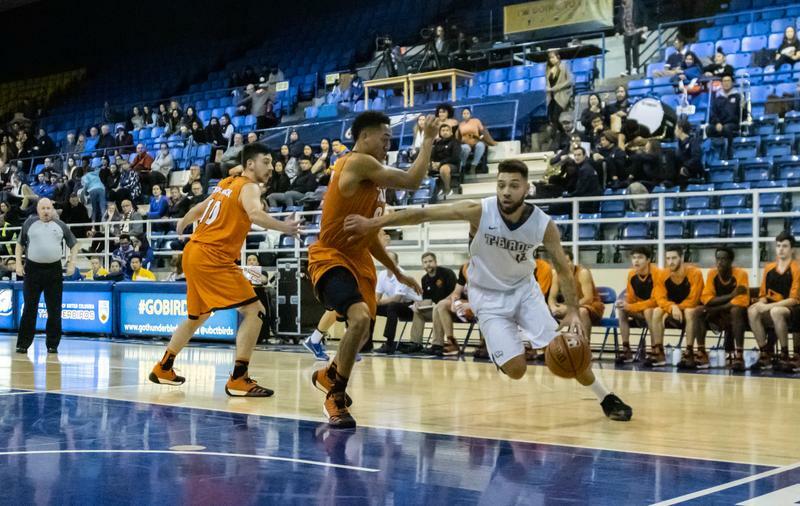 Meanwhile, the men’s basketball team narrowly escaped a three-game playoff-opening series against the University of Fraser Valley (UFV) Cascades over the weekend to move on to the Canada West semifinals against Alberta. UBC was the favourite in the series against the Cascades, but a 72-92 loss in game one on Thursday meant the team had an uphill battle on their hands. They completed the comeback with 85-58 and 85-73 wins on Friday and Saturday. As usual, the trio of Jadon Cohee, Manroop Clair and Grant Shephard led the team throughout the series, with the three of them leading the team in points on Friday and Saturday night. They head to Edmonton this weekend to face the Golden Bears, a team who finished the regular season just above UBC in the standings based on RPI: UBC ended on a 0.601 RPI while Alberta was at 0.613. The teams met in the final regular season series on February 1 and 2, two games which Alberta narrowly won 85-75 and 87-79. While one team swam, another team sank out at Doug Mitchell. The men’s hockey team saw their playoff hopes end after a three-game quarterfinal series against the Mount Royal Cougars. After losing 4-2 on Friday, the team fought back for a 3-1 win on Saturday to take them to game three. They would end up losing 5-2 in that final match up.